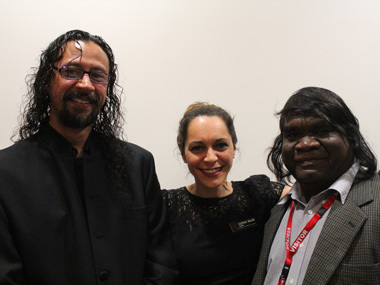 Abe Muriata is represented as one of 16 artists Australia wide in the WA Indigenous Art Awards currently on display at the WA Art Gallery in Perth. Shortlisted from 100 entrants Abe travelled to Perth for the opening of the exhibition and the awards ceremony. 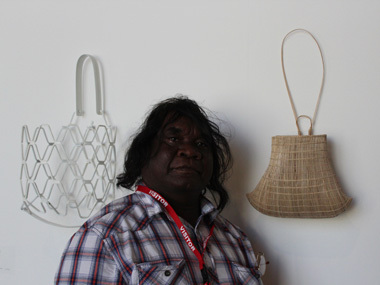 “To be chosen from such a vast sea of talent was a privilege for me,” Girramay Traditional Owner and artist Abe Muriata said. Abe appreciated having the chance to meet and talk to other artists participating in the award, to see their work and to learn more about what art means to a variety of people, the artists, the critics, the gallery staff and the audiences. “To be able to meet the other artists helps you understand the background of the people and places reflected in the art we see, in the desert, the sea, the Torres Strait, the city and then there is me from the Wet Tropics of Queensland. “Being able to attend the awards has taught me not to stay away from boldness, to not be afraid to be loud or forward with my work or ideas. Abe Muriata is a Girramay Traditional Owner and is represented by the Girringun Aboriginal Art Centre in Cardwell.